After five and a half years, 226 posts, and over 2800 images, with this post I bring Drawing Life to a close. Don’t worry – all the posts will remain online, and at the end of this post I’ll provide the link to a new site where I’ll share my work going forward. I’ve been going through a major transition in my life and it’s time for a kind of rethinking and spring cleaning of all my habits and practices. The images accompanying this post are from an experimental drawing session I did last March with model/collaborator Kristin Hatleberg. 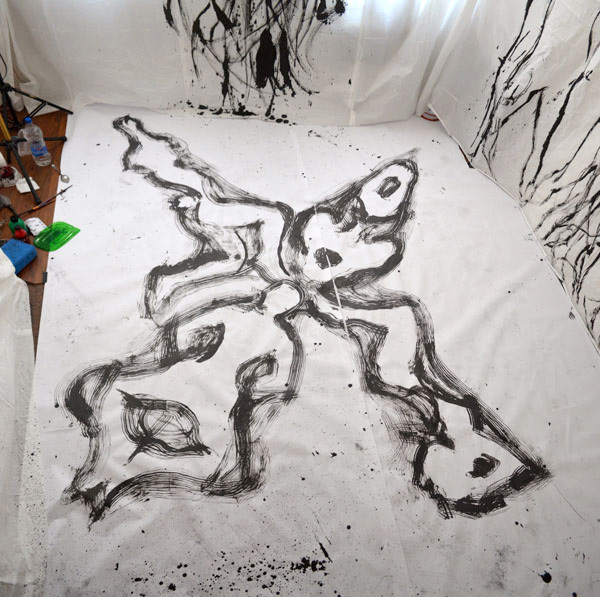 I turned my whole studio into a cave of paper and covered the walls and floor with ink strokes tracing the outline or shadow of the body in motion. That was around the time my life transition was getting started, and this session was a sort of ritual for new creative possibilities. I rarely write about my own life here on Drawing Life. I avoid drama and so I imagine my life would be pretty boring to anyone not close to me. I devote much of my free time to drawing, photography, and other creative pursuits. While I show work and do events and performances fairly regularly, I’ve always maintained my art as an amateur practice. Of course the word “amateur” means lover, one who does something for the pure love of it. Since I work for a living, I don’t have to worry about creating work to please a market or to make it fit what some critics want to write about. I keep the work free, and I follow it wherever it leads me. To be honest, while I love a lot of living artists and their work, the international contemporary art scene as a whole, with its mega-wealthy collectors and ego-driven art stars, its combination of pretentious discourse and cheap gimmickry, bores me, and while I ignore this official Art World, it ignores me back. I’d rather treat my work as my own exploration of perception and practice. I do want to use it to communicate to a larger audience, but I’m actually more driven by the pleasure of sharing one on one, the special connection that develops between me and my models, the people I sketch portraits of and the people whose bodies I paint, the dancers and performers I collaborate with, and the fans of my work that visit my studio, sit with me on the floor and look through piles of drawings or photographs. For a very long time, I’ve lived a Bohemian lifestyle in New York, making my living through freelance photography, video production, film projection and other audiovisual work, with occasional commissions or paid gigs as an artist, teacher or performer. I’ve usually worked as little as I could get by with and kept as much time as I could for my creative work. The cost of living in the city has gone up and up in recent years, but I never had too much trouble finding paid work, though the older I got the more my lack of savings and lack of health insurance concerned me. So when I found the opportunity to take a job with good pay and excellent benefits, I went for it. I’m now a full-time film projectionist at the Museum of Modern Art, the first stable full time job I’ve had in over twenty years. I’ve been a backup projectionist there since 2011, working full time hours since one of the full-timers retired last spring, and an official staff member since August. While I have been giving more of my time to paying work – even before my hiring at MoMA I’d been working an erratic but heavy schedule for the last couple of years – I have kept producing as much artwork as ever. While I haven’t been posting here on Drawing Life as frequently as I once did, this year I’ve done tons of drawing and photography, several live performances and film projects in collaboration with dancers, and have been developing a number of long-term projects that need time to come to fruition. The job, with its demands, its regularity, and its security, changes everything. For a while I thought I could just re-arrange all my old activities into the new schedule, but it isn’t so simple. I’m determined that these changes will not diminish my creative life but will allow it to achieve greater depth. I could choose to keep posting here at Drawing Life as I have been. The list of yet-unwritten blog post ideas I maintain now has over 250 entries, some of which are sets of work that already exist and could simply be arranged for presentation on the blog. But I also want to devote some of my writing energy to a longer form, to a book or books that can develop some of my ideas in more depth. I think the internet is better suited to snippets and tweets and quick takes. Drawing Life’s picture essays have reached a small but appreciative audience, but they represent a sort of middle level of complexity, not enough for a deep read but maybe too much for the multitasking web surfer to take in. So I’m going to write a book. Wish me luck at achieving the kind of sustained discipline that will need. I’ve started a new blog, a Tumblr microblog called Inklings, where I’ll regularly share individual drawings, paintings and photographs, short films, and brief poems and paragraphs to inspire and please my fans. I’ve already added two posts there, a drawing and a four minute film about the wind. I expect to post there twice to thrice per week. What goes up there will also be shared on Facebook and Pinterest and Twitter, so follow the stream at any of those places. Some of the online book services have blog-to-book functions, so I’m also thinking of making a Best of Drawing Life collection that you can download as an ebook or, better yet, order in hard copy. This would have maybe 50 or so of the most popular posts that have appeared here. Does that interest you? Would you prefer, say, photography and drawing posts in separate collections, or everything interspersed as has been the way on the blog? Are there any particular posts you’d like to nominate for the collection? I’ll continue to check the comments here! Today, on Drawing Life’s fifth anniversary, I would like to invite you to an exhibition (details at the bottom of this post) and to ask the question, “Why is ‘drawing’ called that? The word “draw” comes from Old English and Germanic terms describing various forms of pulling. Sometimes it’s draw, sometimes drag, draft, or the like. We have phrases like draw back, draw forth, draw out, draw in, draw from, draw towards, draw up, draw down. An account can be overdrawn, a character in a play underdrawn, breath indrawn. You can draw a card, draw a gun, draw a conclusion, draw a crowd, draw a salary, draw a carriage, draw water, draw fire, draw a blank. Supposedly the reason we use the word for sketching, or for making pictures, is because we draw our charcoal (or other marker) across a page. But of course the hand engaged in such action is pushing as much as it is pulling. Maybe if we called it “pushing” instead of “drawing”, we would think of this artform differently. But the sense of pulling seems right to me in myriad ways. To draw observationally is to draw near to something, to study it as if you could pull its essence into you through your eyes. The artist draws inspiration from the subject. By having a subject or object of study the artist remains grounded in a living relational reality, drawing the spirit of life into the picture. 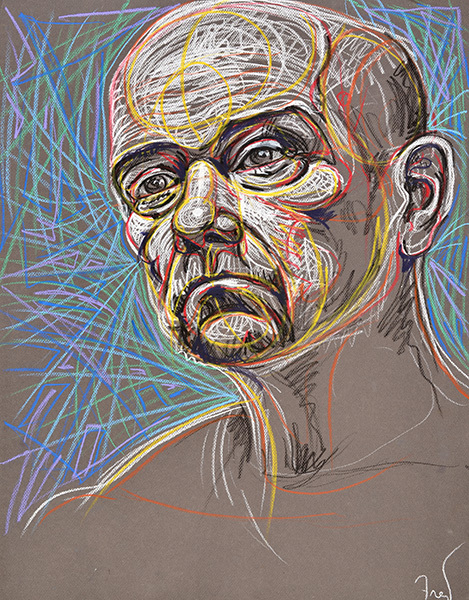 To draw imaginatively is to draw images, entities, energies up from the unconscious. It is to find embryonic notions and incubate them, and to coax them out of the nest. It is to exaggerate, to extrapolate, to speculate, to reach into the well and draw up the water of potentiality, to make the unreal visible. To draw abstractly is to draw upon primeval attractive forces and the structures and processes that derive from them. It is to know hues and shades as pure qualia, to know marks and shapes as matter and energy, to know structures as harmonies. To share one’s artwork with another person is to attract someone to you not with your looks but with your vision. Even the work of an artist long dead, if it be strong, brings some of those that experience the work close to the artist’s bosom or cranium. The audience is pulled into the artist’s way of experiencing the world. Of course most of what I’m saying applies not just to drawing per se, but to any really great work of art, be it music or dance, storytelling or performing. Art is what draws us. It draws us out of ourselves, draws us to a new way of feeling. Art draws magical power out of humble, earthy materials. Art calls up the bright spirits and the dark spirits so that they dance for us. Art draws us in. It draws out the creative power that is hidden everywhere and in all. Inspiration means the drawing of breath. Our consumer culture is all about taking in. Drawing is taking in with acute high awareness. Most of our contemporary arbiters of culture think of drawing as a subsidiary thing – a training practice like a musician’s scales, a quick and dirty throwaway tool like brainstorming with Post-It Notes, a messy way of working out a composition or concept, like a plot outline. 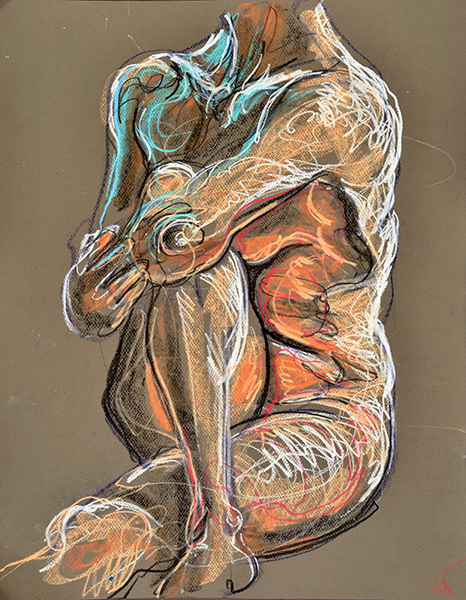 They see drawing as sketchy, undeveloped, unsophisticated. I contend that drawing is one of the very most basic forms of art, along with music and dance and performing and storytelling. I think it makes more sense to say painting, sculpture, and design are developments from drawing than vice versa, and so drawing must be considered more fundamental. Those who have followed this blog over the years know that I work with photography, video, performance, body art. 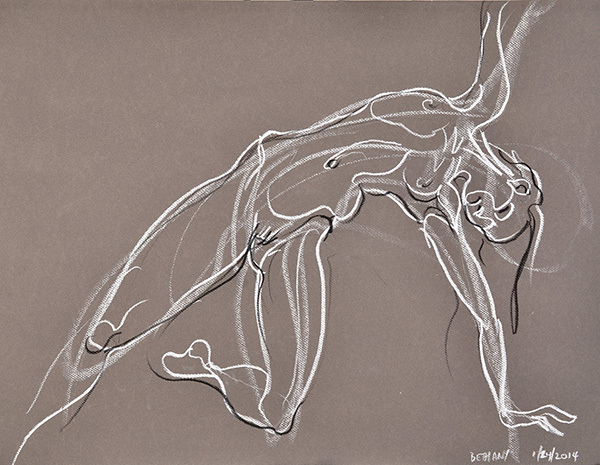 I think of drawing as the root of my practice, and the other forms as extensions or variations on drawing. 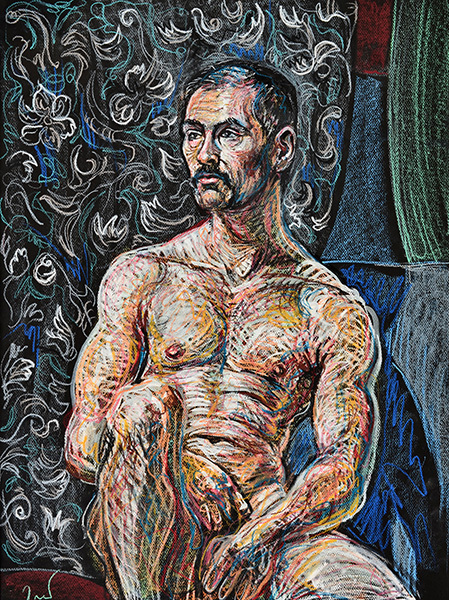 The images accompanying this text are details of figure drawings, doodles, abstract paintings, photographs, and body art. 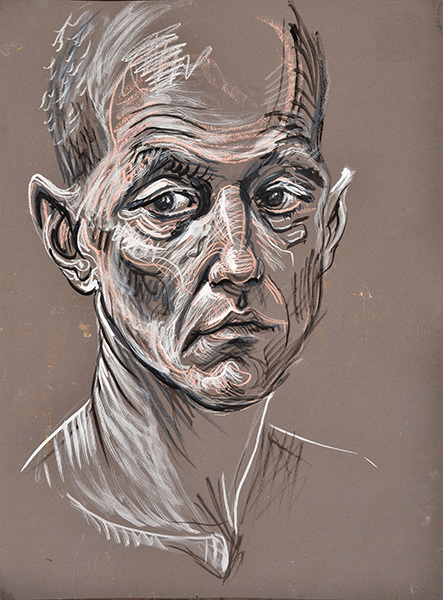 For me they all have some quality in common – a quality that is the essence of drawing. 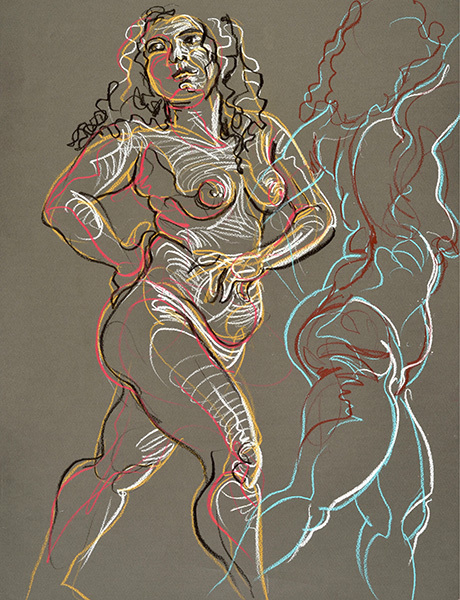 Where do you draw the line to define drawing as distinct from, say, painting? Wet media vs. dry? That doesn’t quite nail it. Some pastellists call their work paintings, while ink wash or watercolor sketchers may call their work drawings. Quick vs. developed? That doesn’t work either. There’s a fashion in the art world these days for painstakingly obsessive works using ink or pencil, works that may take longer to make than most paintings, and usually these get called drawings. 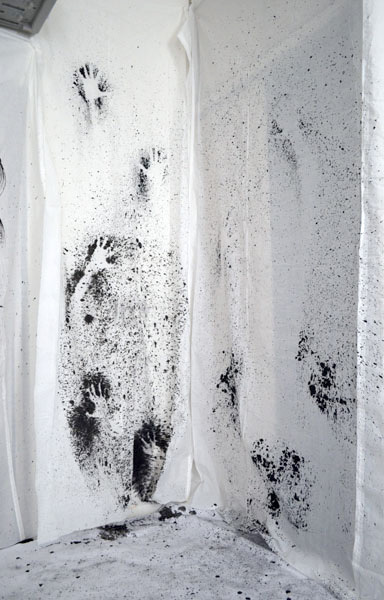 My friend Lorrie Fredette, sculptor and installation artist, recently made a series of works using sutures, black and white threads sewn into sheets of paper, and she called these drawings. Not all drawings are linear, not all are monochromatic, not all are simple. If there is an essence that defines the art of drawing, it might be directness, or spontaneity, the distillation of energy in image. What do you call an artist whose primary focus is drawing? Draftsman? That sounds to me like someone who makes schematics and blueprints. Calligrapher? Graphic artist? Designer? Cartoonist? Sketcher? Delineator? Depicter? Tracer? Doodler? Those are all subsets of drawing. “Drawers” usually refers to either sliding storage compartments or underpants, so that doesn’t quite fit the bill either. I have seen some use the term “drawist”, but that seems to me an awkward construction. I think I will have to settle for calling myself a drawing artist. If you are someone who draws, or who loves drawing, let me know in the comments section what drawing is all about for you. 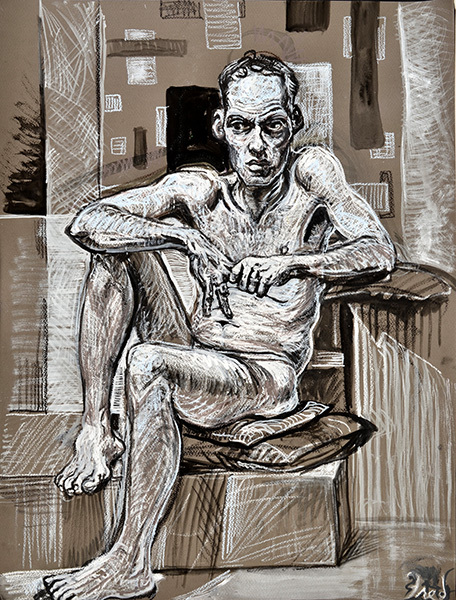 If you’re in the D. C. area you can see one of my original drawings in the exhibition “Melange“, curated by Iurro, at Artspace 109, 109 N. Fairfax Street, Alexandria, Virginia.Artists in the show include Rachel Blier, Peter Bottger, Joren Lindholm, Scott McGee, Paul McGehee, Jitka Nesnidalova, Tea Oropiridze, George Tkabladze, and Tati Valle-Riestra. The opening is Sunday March 16, 3 to 6 PM. The show will be up March 18-May 10, 2014. Claudia posted some of my quick sketches of her on her blog, Museworthy. Check ’em out! 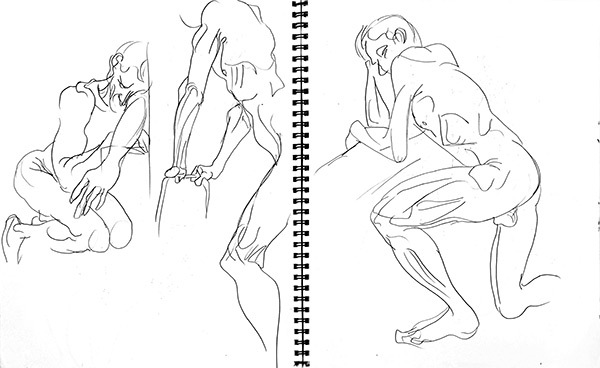 Quick poses are the very essence of life drawing practice. The word “quick” originally means simply “alive” as in the quick of the fingernails or the phrase about judging “the quick and the dead” from the Apostles’ Creed. Abruptness and rapidity are the qualities that exemplify aliveness. 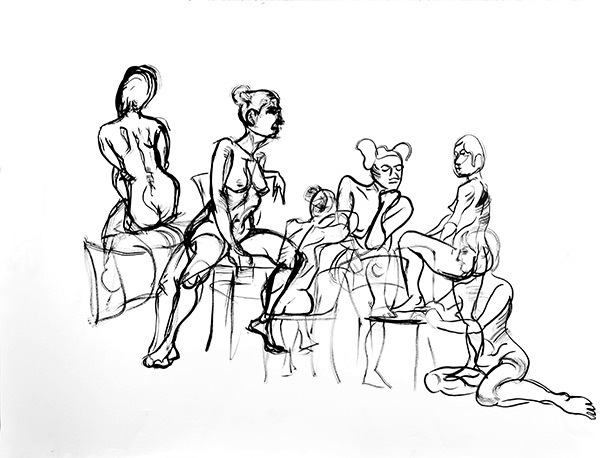 So life drawing is quick drawing, and capturing the life force of the subject is done only with speedy, efficient marks. When a model holds a pose for a period of time, the energy and intensity, inevitably, gradually drain from the pose. 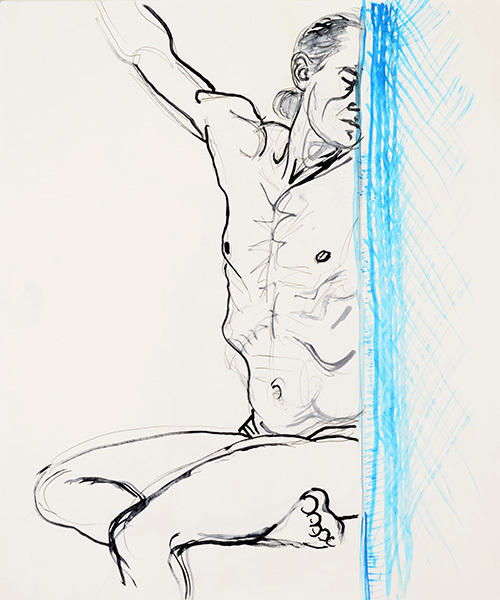 Capturing the energy depends on immediate response and a complete lack of hesitation or dithering, even in cases where the artist has hours to study the model. In this post I’ll share some recent speedy sketches made sometimes under difficult conditions. 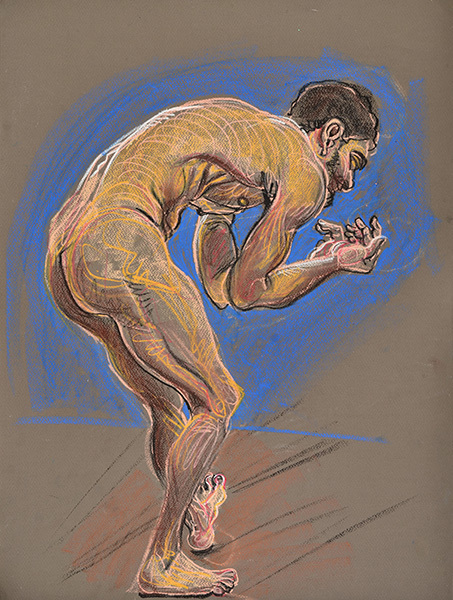 Classical academic drawing techniques, like those taught in Bargue and Gérôme’s Cours de dessin are analytical and methodical. They provide ways to achieve rigorous observation and accurate rendering of objects and figures. 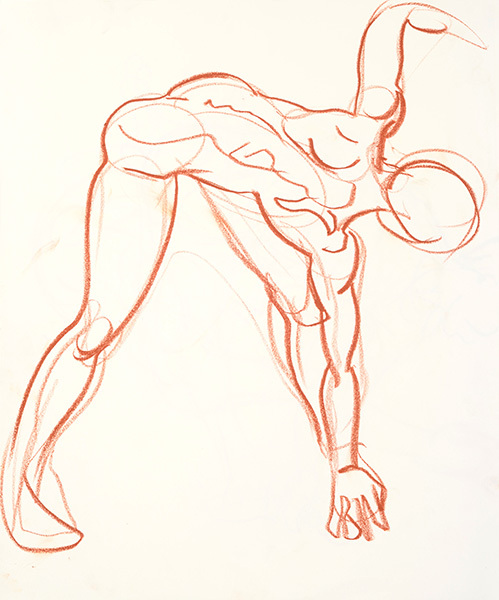 These techniques, though, are quite useless in capturing a pose a model can only hold for a brief interval, and they do nothing to teach an artist to work with flow and rhythm to get the feeling of energy and liveliness into the work. When the drawing has to be quick, I prefer an approach in which the marking is a direct response to the act of perception. 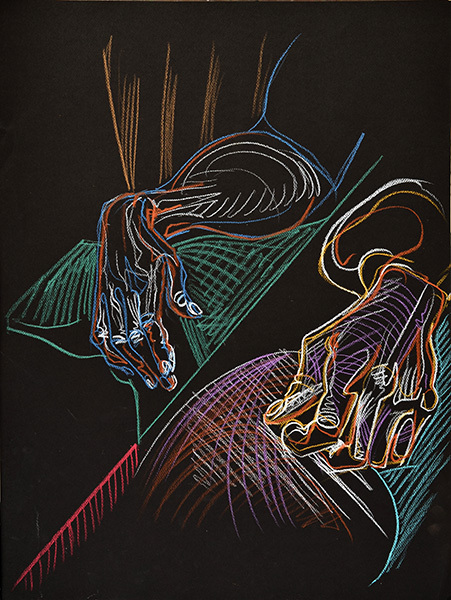 A glance of the eyes picks up the curve of an arm, for instance, and within a fraction of a second the hand holding the pen or brush or charcoal is imitating that curve. The eye falls upon the subject and the marker lands upon the page, cascading with a swerving dash that closely follows the swoop of seeing. The resulting sketches are rough and highly approximate in proportion, but they are lively and full of verve. 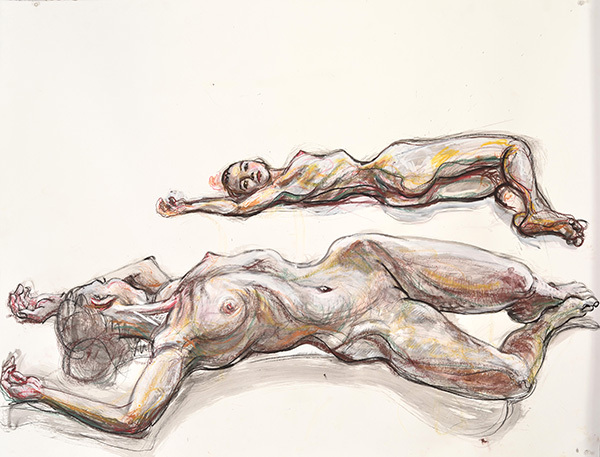 Since May of this year, Minerva Durham, the founder and director of NYC’s 7-days-a-week figure drawing center, Spring Studio, has been holding outdoor life drawing sessions with clothed models in Petrosino Square, just around the corner from the studio, in protest of an art installation area in the park being converted to a corporate-branded bike sharing station. 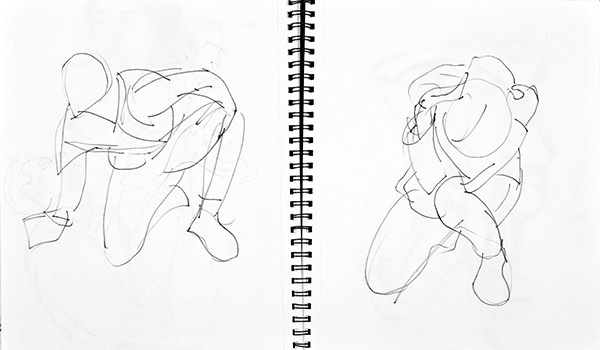 I made these drawings in the park with a great dancer/model called Magic, in a session shown in this video. 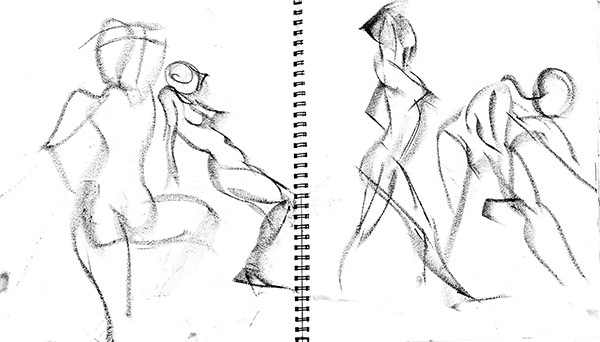 I think these are one minute poses. 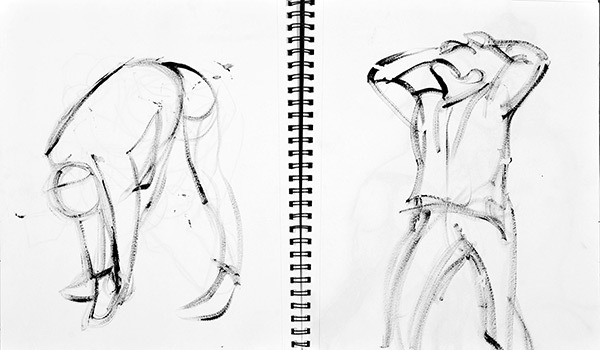 It was cold, the wind was blowing the paper, and my pen was running out of ink, but I was trying to capture the energy of Magic’s poses with rapid marks. I tried using a fine-point sharpie (above) and a brush and black gouache paint, without any water to smooth the application (below). I try to simplify what I see into directions and angles, but always keeping an eye on full shapes, never just lines. I don’t worry about the finished product, just the immediate process of transforming perceptions into marks. 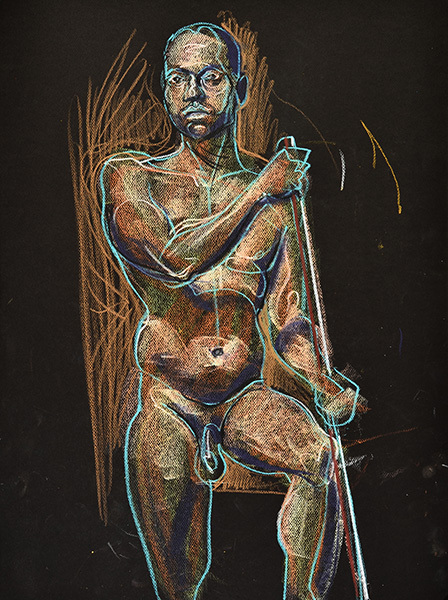 In July, at the Sirius Rising festival in Chautauqua County, New York, I attended a life drawing class led by Bellavia, the artist whose sculpture was featured in this recent post. The workshop was held in an open-sided pavilion and, as with the Petrosino Square session, there was a constant struggle to hold the drawing paper flat in the gusty wind. 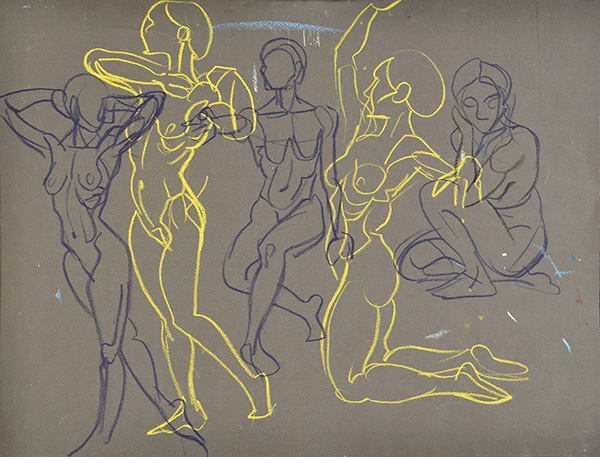 To encourage the artists to let go of tentativeness and draw boldly, Bellavia had the model do a lot of ten and fifteen second poses, and encouraged the artists to draw with the flat edge, not the point, of the charcoal. Any hesitation at all would make it impossible to draw anything. I practice quick drawing a lot, but usually the quickest poses I draw are one or two minutes. Ten seconds is just a blip in drawing time! 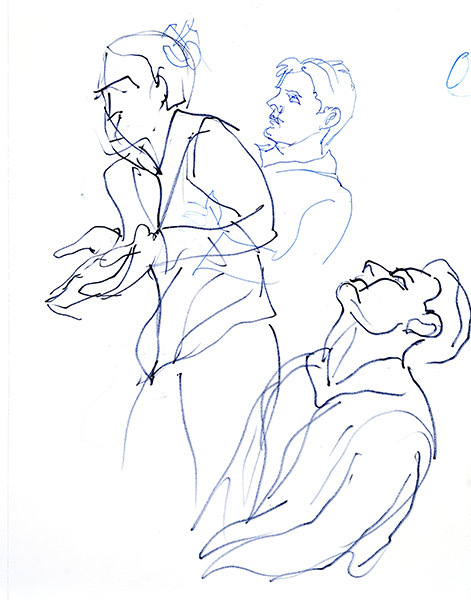 Some of the drawings from that session have an almost cubist abstraction. Last May, the ADaPT (A Dance and Physical Theater) Festival, based in California, came to my neighborhood in Brooklyn, with performances at CPR (Center for Performance Research). Festival director, dancer and artist Misa Kelly asked me to help organize a life drawing session in the performance space preceding the dance performances, an event described in this blog post. The models were Misa and Nushka. Since we were working in the very large performing space at the center, I took the opportunity to work in a large scale. 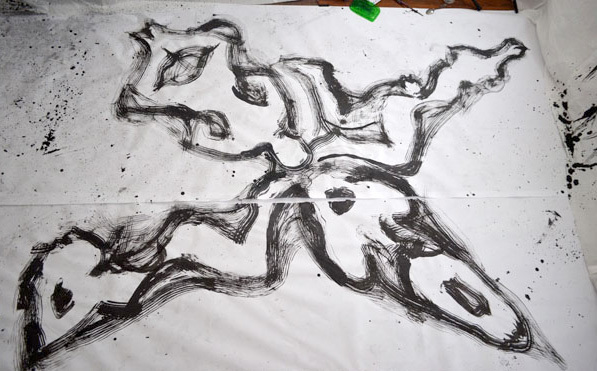 I had five sheets of 38″ x 50″ (97 x 132 cm) paper, using one for each 20-30 minute drawing segment, drawing flat on the floor with brushes and sumi ink. I planned the session in correspondence with Misa and monitored (supervised and timed) the session, with a selection of invited artists drawing. The first set was ten one-minute poses, three three-minute poses and one five minute pose. 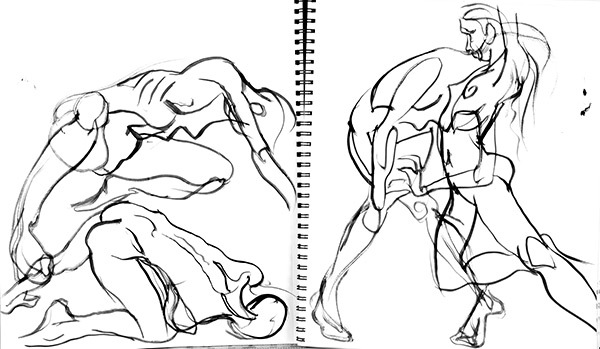 Of course when there are two models and you try to draw both of them, one minute is just thirty seconds per pose! followed by four three-minute “moving poses”, in which the models performed a simple movement phrase repeatedly for three minutes. 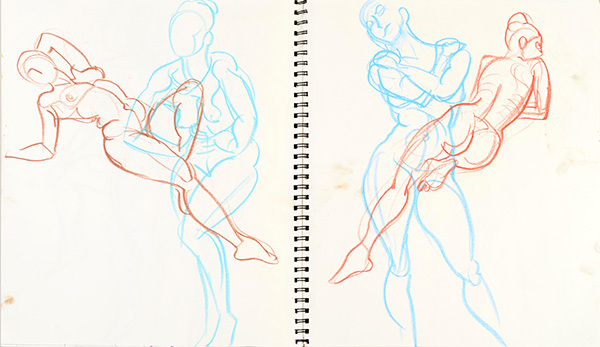 This was real movement drawing – the eye had to take in a shape and then draw it from memory, because even a second later, the body position had already changed. 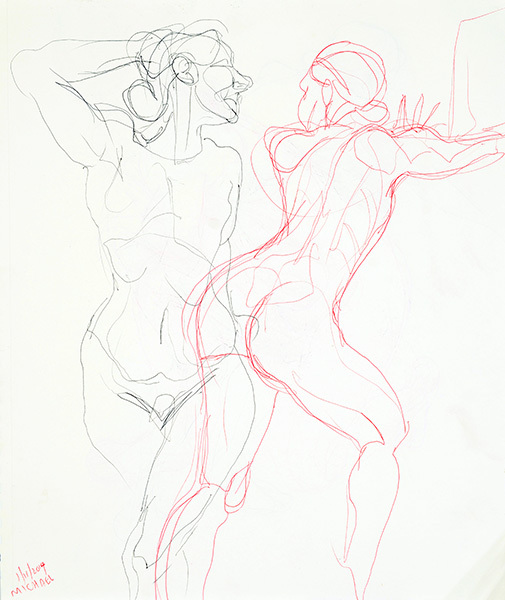 Then there was an eighteen minute pose (the back-to-back pose at the top of the drawing below), and then ten one-minute and five two-minute poses, on the lower part of the drawing below and the one below that. 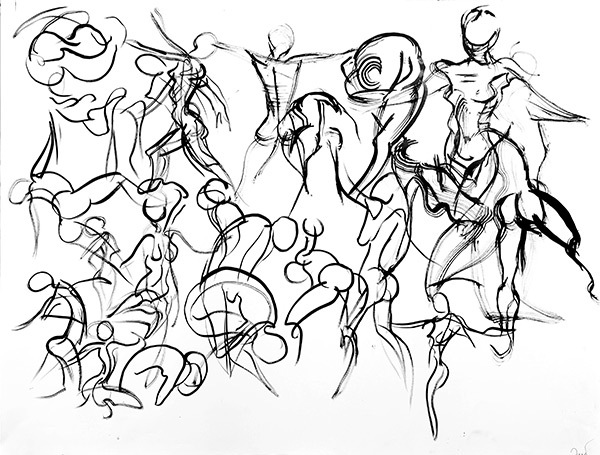 Working with very quick poses or models in motion, I like to use a brush and ink. The brush flows with less friction than dry sticks and there’s no time to fiddle around with re-assessing and correcting things anyway, so there’s no reason not to use an indelible medium. 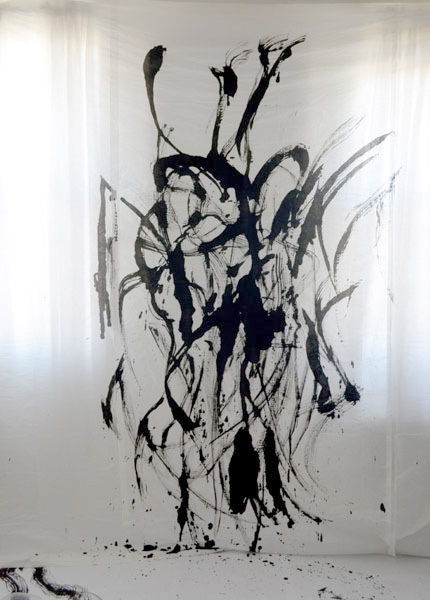 As in the asian art of calligraphy, the essence of the act is completely in the moment, in the freedom and intuitive engagement of the slippery brush. When atoms move straight down through the void by their own weight, they deflect a bit in space at a quite uncertain time and in uncertain places, just enough that you could say that their motion has changed. But if they were not in the habit of swerving, they would all fall straight down through the depths of the void, like drops of rain, and no collision would occur, nor would any blow be produced among the atoms. In that case, nature would never have produced anything. 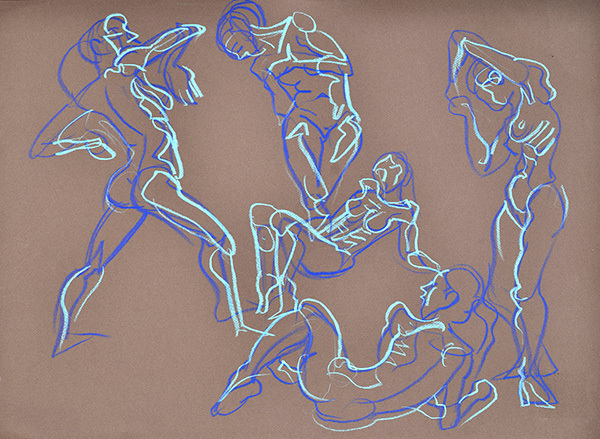 The “swerve” of the drawn line is what makes it expressive, and what makes it a recognizable analog of the subject being depicted. Physics may involve a lot of straight lines, but biology is all curves. 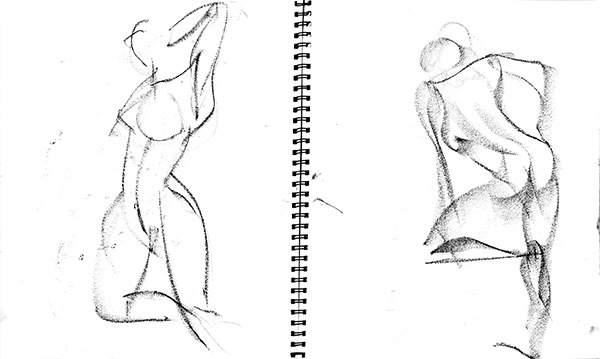 To study biological forms through drawing is to work with curves in all their varieties. Quick drawing is like skiing the slalom, sliding with maximum speed, swerving with maximum responsiveness. 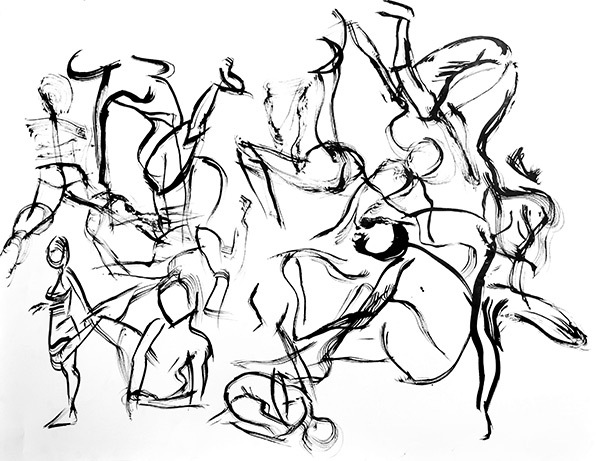 When it works, a few simple strokes of ink can suggest the propulsive or serene energy of the living body. 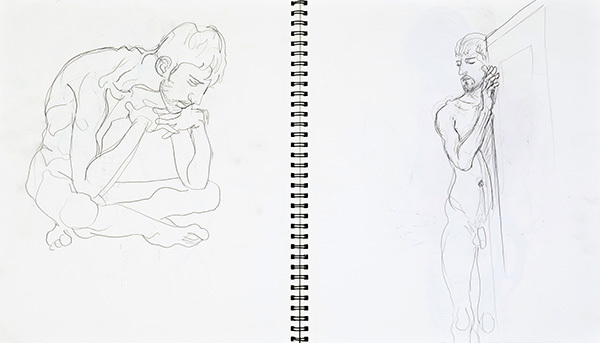 The sketchbook pages shown in this post are 14″ x 17″ per page, usually shown as double pages. 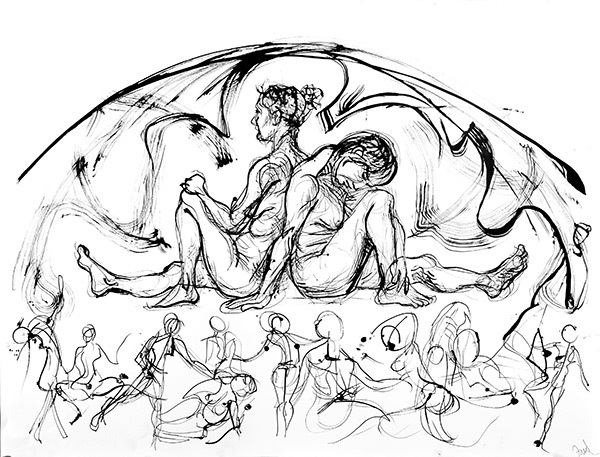 The “AdAPT Festival” drawings are 38″ x 50″. 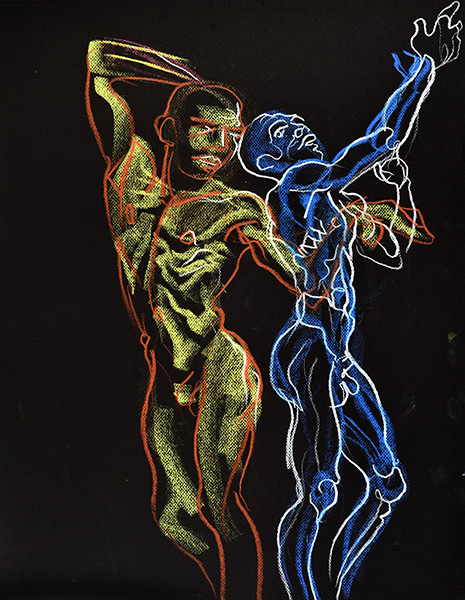 The drawing at the top of the post is aquarelle crayon on black paper, 19″ x 25″.